During a house fire, many times the homeowner is distraught, frantic, hysterical, or unconscious from smoke inhalation, or worse. This makes it very difficult for firefighters to determine quickly where there may be children that need to be rescued. Every second counts in a fire situation. Fire doubles every six (6) seconds – that’s FAST! A split second decision by a firefighter during the time of fire, based on a sticker that was placed by Operation Fire Safety, can potentially save thousands of children from severe burns and death. 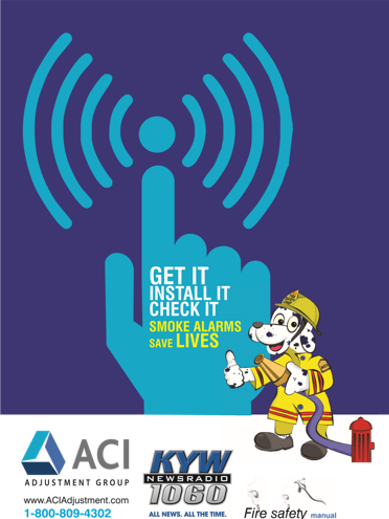 This is an initiative that Operation Fire Safety is determined to bring back into full effect! Those who have pets know that they become members of the family. Many times during a fire, a pet can be trapped in the home while the rest of the family is safe outside. Unfortunately, sometimes a family member will rush back inside the burning home to try to save their pet – resulting in human injury and death. The Pet Finder Sticker goes on a window near a first-floor door in your house and lets the fire department know if there may be a pet trapped in the home. Many times this sticker will give the pet owner the courage to save themselves and let the firefighting professionals handle any necessary rescue efforts.